Bread rolls were always be an essential part of our meal Everyone had their favorite bread rolls but mine was a dinner roll. 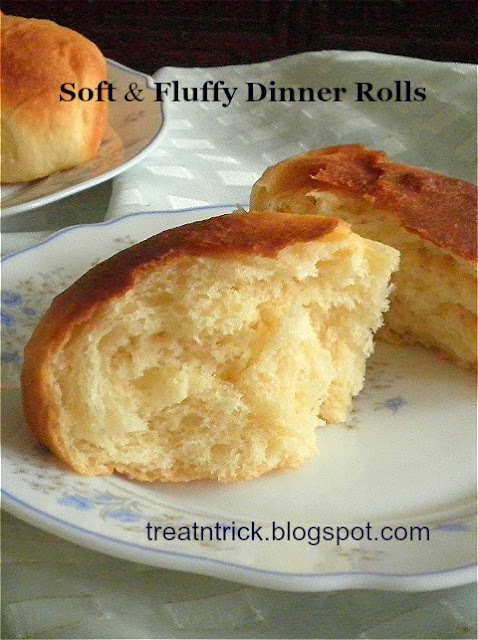 From this Soft & Fluffy Dinner Rolls, you can create a lot more variations either sweet, savory or stuffed. Am going to show you, how to bake these fantastic rolls..
You will find Soft & Fluffy Dinner Rolls recipe looks similar to other bread you've baked but the method are a way simpler but turned out fantastic. It begins with melting the butter using microwave or stove top then adding milk to bring down the temperature. This is a important step before adding yeast, it should be warm to touch and not hot if not you would kill the yeast. Stir and keep covered for 5-10 minutes if you're using active dry yeast until it becomes frothy but if using instant yeast, you can skip the waiting time. After combining the flour and milk mixture, stir with wooden spoon until well incorporated. At this point, it becomes sticky so cover the bowl and let rise for one hour. Punch the dough down, knead the dough, scraping clean the bowl until smooth. Add one or two tablespoons of flour if it was sticky. Cover and let sit for another 30 minutes. Now they're ready to be shaped and leave to rise again for 1 hour. before baking. 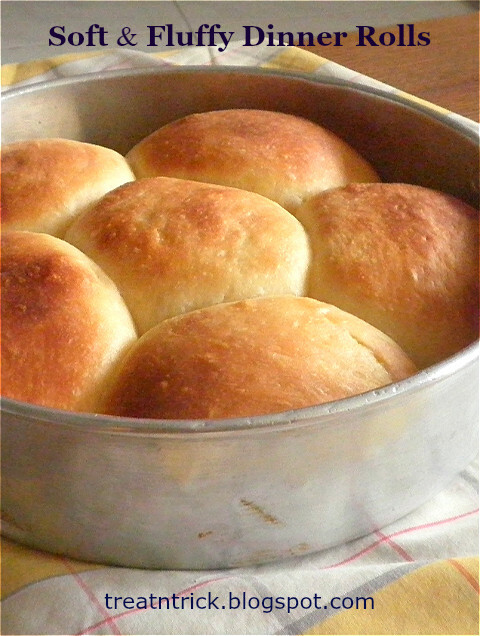 Don't mind to wait for more than 2 hours, in return I was rewarded with perfect, tender and gorgeous rolls! . I love scones. They are so versatile, you can choose from sweet with variety of fruits or cheese ones and not to mention extremely easy. This time, I had plenty of granny smith apples. So this apple is going to be my baking project this week. Always prefer to make a small batch so just used one and quarter cup of flour. 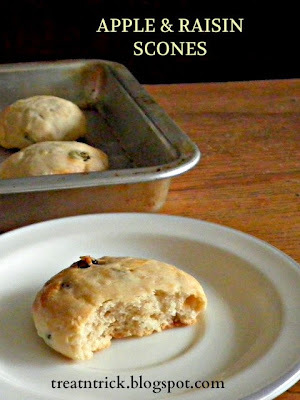 With this recipe you could get 9 x 2.5 in scones, just sufficient for the small family. 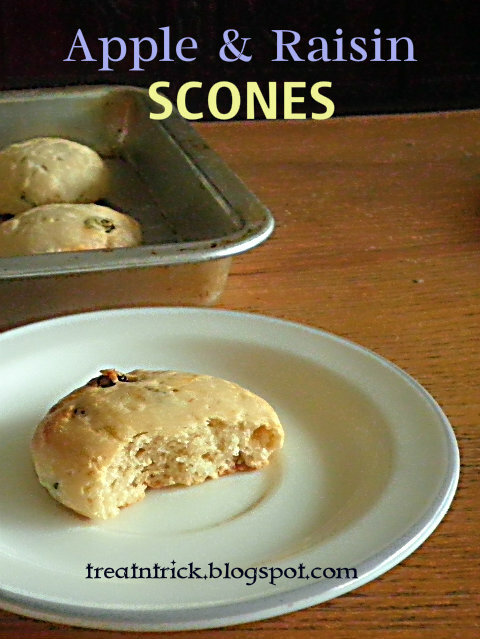 Making scone is almost the same as baking pie or tart. This requires you to blend dry ingredients with cold butter using your finger tips until it resembles bread crumbs. The secret of good scones are not to handle the dough too much before baking. It should be sticky and not too dry. Dip your cutter in flour each time before cutting out the dough. Despite containing no eggs in the recipe, the scones are well risen, feather light, soft and utterly delicious. My family enjoyed them fresh from the oven without any preserves or butter but prefer to add one more apple next time I bake them. 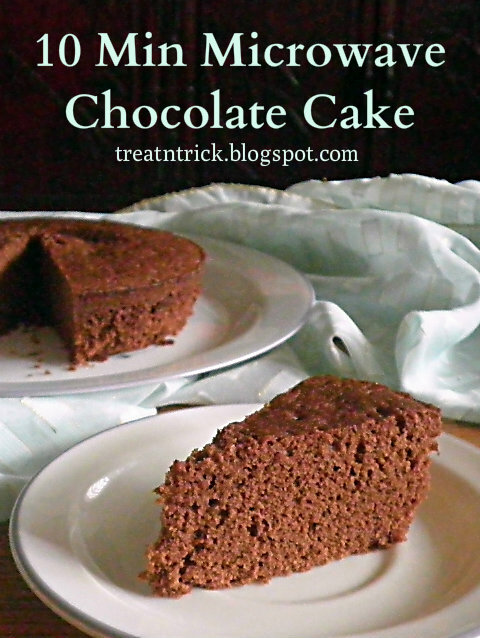 This 10 Minute Microwave Chocolate Cake is the ultimate choice to satisfy your sweet cravings. quickly. Made with all the ingredients you might already have in your pantry without an oven. 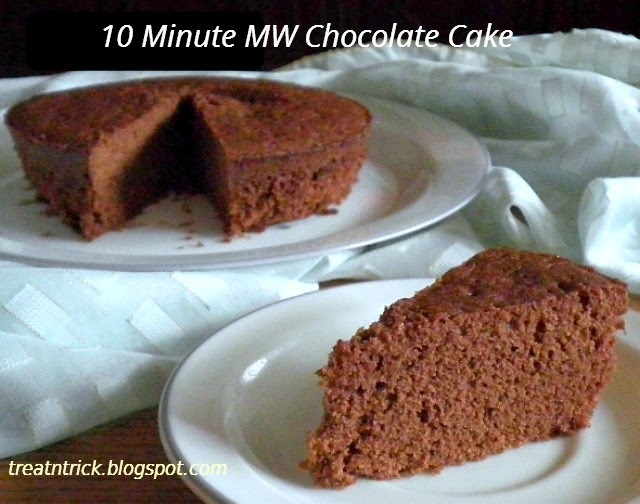 Some of you might think that microwave cake yields a dry and weird taste but this is not the case for this 10 Minute Microwave Chocolate Cake. It was soft and insanely delicious. Make sure you grease your microwave save bowl generously and line with baking paper especially if you're using glass ones. Your microwave safe dish should be deep enough to let the cake rise, fill up only 1/2 of the cake batter into greased bowl.. Mine stick to the bottom of my Arcoflam bowl but I manage to remove it. Baked the cake using High Power (1000 W) for 5 minutes then switch to Medium for another 1 minutes. Do check out your wattage power, if you have a lower wattage you need a longer bake time. Always cook it for the shortest time first, you can add another minute once you check it but you can't take away time when you've overcooked something. These are cubed bread slices, spiced with green chili, onion, cumin and cilantro together with rice flour, semolina and yogurt as a binder. They are combined to shape like a doughnut. 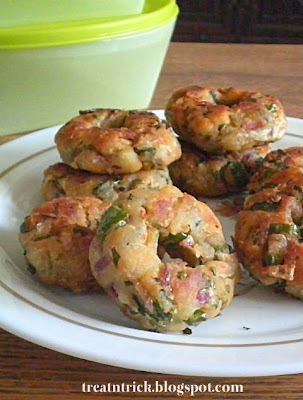 After shaping with greased hands, Bread Vada are fried in oil till golden brown, I did mine by shallow fryingcan also be deep fried. Adjust the heat according to your tolerance. These tasted heavenly for breakfast or as a snack immediately after you've fried them. Actually you can use any of your favorite butter cake recipe. Make it different by adding quartered oreo in the batter. If you want, you can also crush the cookies. Have seen some bakers sandwiched whole oreo in between of the cake batter. Either way, they still turned out delicious. 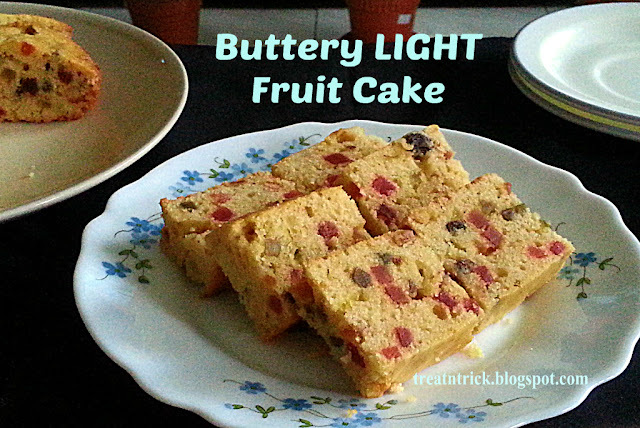 High in fat, butter cake will keep well for several days. 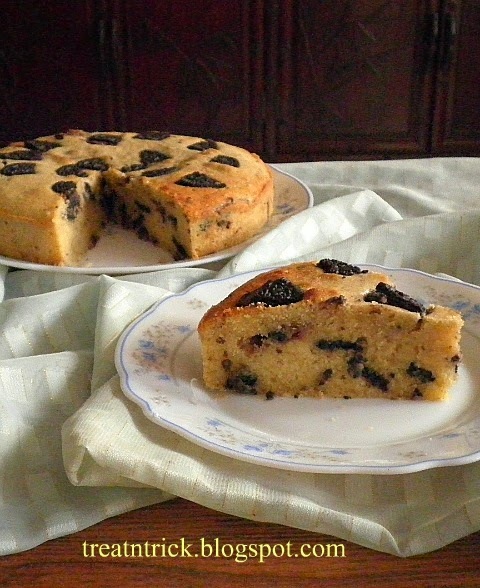 Un-iced, a well wrapped baked cake will keep well in the freezer for 1-2 months.